Replacing traditional air pistols with laser guns will make modern pentathlon safer and more environmentally friendly according to the sport's chief. The technology will appear at June's World Cup final in Moscow and the 2010 Youth Olympics after years of testing. "It's a big step. 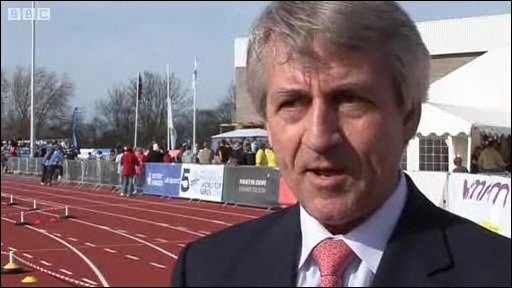 I promised we would work hard to modernise and make it more exciting," pentathlon's president, Klaus Schormann, told BBC Sport. "With the new system, our sport will be much cheaper and safer." The switch to laser technology will be reviewed after a trial period at the World Cup and August's Youth Games in Singapore, with a view to installing it permanently ahead of Olympic qualification in 2011. It marks the second major alteration to the sport since the Beijing Games of 2008. Pentathlon has already merged its two final events, running and shooting, to create a combined run-shoot finale. "The biggest challenge was changing pentathlon in the running and shooting," said Schormann. "The combined event was a long discussion and Great Britain were one of the strongest opponents. But, now they are winning, they can understand we made the right decision. "When we had a discussion with the International Olympic Committee in 2002, to survive in the Olympic programme, I promised [IOC President] Jacques Rogge we would work hard to modernise." In pentathlon's combined event, athletes must complete a one-kilometre run then register five successful shots at a target, a circuit which is repeated several times before crossing the finish line. Sceptics have suggested gadgets as simple as off-the-shelf laser pens could be used to disrupt the new system, but Schormann insists the technology is robust and will revolutionise the shooting event for spectators. "We learned from the military, where laser shooting is very much developed. Why not do this as well in our sport? "In countries where there are very strong laws on shooting, like in Britain, Japan, or many other countries, there are big shooting difficulties. But the new system can be easily handled all over the world. "Nobody can interfere with it, that has been tested. We tested for cross-firing, water, fog, everything - companies have invested a lot of money. And it doesn't affect anyone if you take the laser to someone's eyes, like kids can do. "There will be no dangerous situations and spectators cannot influence the results. The shooting can be in front of the spectators' seats, it's so safe." Asked if pentathlon felt obliged to push through such changes to guarantee its Olympic future, Schormann dismissed the suggestion. "When I came up with this idea I got immediate support. In a few months nobody will discuss it any longer, it'll be like we always did it. "I don't feel under pressure. This is a traditional sport but we say 'modern pentathlon' so we are modernising, we are really using that word."